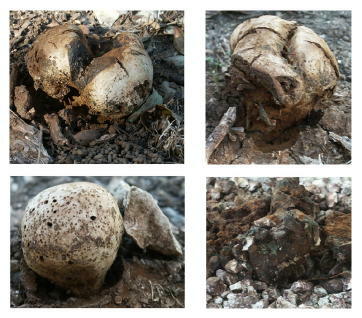 These puffballs are definitely Pisolithus tinctorius. This is a very beneficial fungus an ectomycorrhizal fungus on the fine roots of the oak trees (not the ash). This fungus has been extensively researched throughout the world revealing its importance to tree health and sustainability on diverse sites from sever mining areas to trees in urban landscapes. Usually it does not naturally occur in great abundance on these sites and, therefore, must be artificially introduced into the roots/soil area of these trees. For more information on this fungus visit this web site: www.planthealthcare.com.